Did you write a business plan? Yes, a very basic one. 1. You describe your shop as "...Handcrafted toys inspiring the imagination and fostering the healthy development of the child." Can you talk about how you came up with this concept and was it your original concept prior to opening the shop or was it something that the shop organically transformed into because of the location/neighborhood/target market? I grew up in a Waldorf community in England surrounded by beauty. I worked as a teacher for years both in a Waldrof school and several public schools in New York. Diane and I had spent years sourcing handmade and creative toys for Kaya and we wanted to bring that wonder to a larger audience, to create a place where the magic of childhood was accessible for everyone. Basically, Acorn was the natural development of years of interest in childhood, creativity and wonder. 2. How did you come up with the name Acorn? Can you share 3 other names that were close runner ups or ones that would have been disastrous in hindsight? Acorn - a Brooklyn Toy Shop was definitely the one we kept coming back to but we also considered Bow Peep, Kaya, and Play. We are glad we went with Acorn! Children love to collect acorns, and the acorn is an ancient Nordic symbol of life, an old folk belief holds that carrying an acorn insures a long life. 3. Karin is an amazing artist and Diane is in the film industry where she's produced, directed and is the co-founder of a production company. Can you share your a little bit about your backgrounds and talk about what compelled you to go into retail? Did either of you have any retail experience prior to opening the shop? Do you think it's necessary? Neither Diane nor I had any retail experience. After years of sourcing items in Europe and in catalogues for our boy Kaya, we decided that there must be other parents who would like a shop where they could find the kind of well made, durable, beautiful toys that were readily available in Europe but hard to find here in the US. We wanted to open a business that would be fun, engage with people of all ages in our local community and give us some basic stability that, as freelance artists, we had not had. 4. You've been in business since 2004. Was there a year where you felt some kind of sigh of relief and felt confident that you weren't going to be part of a statistic? They say that in the restaurant business, you shouldn't expect to see any profit until your second year - is it the same for retail in your experience? What should aspiring store owners be prepared to expect? We were pretty lucky and hit the ground running by opening before the holidays. Every year has seen a significant increase since then until the market crashed in October 2008, at which point we hit a plateau. But we anticipate seeing growth again by September! 5. Acorn has received a good amount of press coverage since you opened. Do you have any marketing and promotion tips for aspiring and shop owners? Until we launched our website last month, we had never written a press release or sought out press in any way. We were always just lucky that editors found us and liked the shop. My advise is to love your shop, make good consistent choices and do not stray from your vision for your business, even if you know you would make more money in the short term by making certain compromises. Do not Dilute. Offer something that is needed in your community and do that well. The press will come. 1. Have a clear vision and parameters for what you plan on carrying in your shop and stick to it. You can be very creative and continue to add new products that make your shop fresh within that framework. You will of course find new things that seem great but don't really make sense with your brand, resist those things! Do not try to be all things for all people. 2. Have a clear budget set before going on a buying trip or to a trade show, and stick to it! 3. Trust in what your initial impulse for the shop is and what you want to offer your customers. Truth be told neither of us love spread sheets or numbers that much, but Diane does keep me in check with buying! If we can't afford it, no matter how perfect it is for the shop, she will say we should wait another season to introduce a new line. I am all about the look and feel of the shop. I think it is most important to have a shared vision for your business. We have different areas of expertise in buying, I do clothing and the younger children's toys and Diane always finds new products for the older children. Diane has an encyclopedic memory of what we have already ordered, whereas I can be drawn to buying multiple items that are in the same category and therefore in competition with each other, like the year I bought 5 different kinds of memory games! 8. What's the best lesson that you've learned so far in owning your own business that you can pass on to our readers? Sales are dependent on the energy in the shop. Pace yourself, do whatever it takes to keep loving your business. If you are worn out it is palpable, so take time off and let your enthusiasm for your business be contagious. Hire people who really get what you and your business are about, and have their own unique contributions add to the business. Thanks Diane, Karin and Zak!! Oh, this sounds like a fantastic shop! I would love to visit! 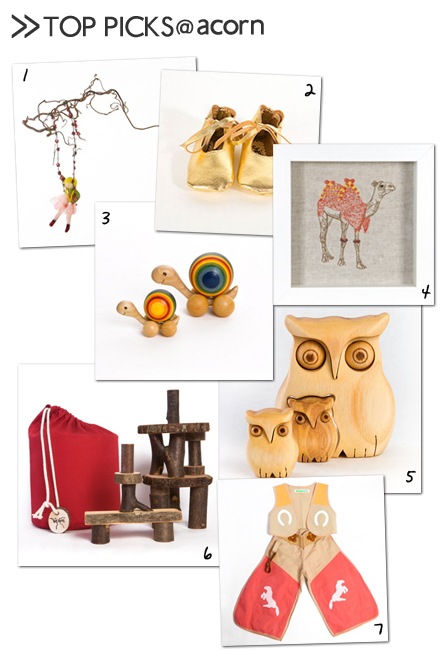 I am already in love with the little owls, the camel print and the gold mary janes! These features are always my favorite and always inspiring. They make me want to go and visit each and every shop. Keep them coming, please! I have those tree blocks (yes, as a childless thirty-something year old) and I love them.